The 17th edition of the Maruti Suzuki Raid de Himalaya will be flagged off on October 9, 2015 from Shimla. 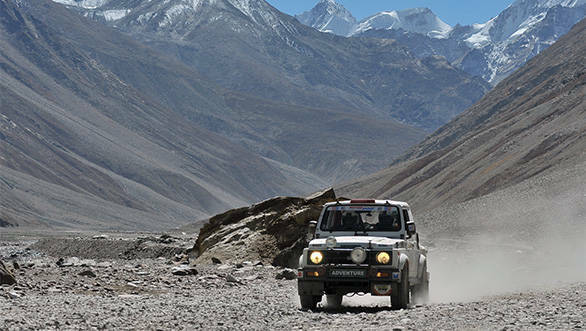 Because it is a rally conducted in the highest altitudes in the world, the Raid de Himalaya is considered the ultimate test of both man and machine. Over 150 entries are expected in this year's rally. Participants will be tackling the treacherous Himalayan terrain through iconic locations such as Manali, Dalhousie and Rangdum before crossing the finish line in Srinagar. The total distance covered in the six-day rally is around 2,000km. The Raid de Himalaya is split into two categories - Adventure and Xtreme. This year, for the first time, the Xtreme class has received 67 entries in the Motorcycle and Quad classes. There are 38 participants in the Xtreme Cars and Trucks category and 46 in the Adventure category. Maruti-Suzuki will also debut its latest crossover, the S-Cross at the Raid de Himalaya. Four S-Cross cars will join the field in the Xtreme class. Raid de Himalaya veteran, Suresh Rana, will also participate in the 17th Maruti Suzuki Raid de Himalaya. The nine time winner is expected to put up a fitting challenge to all competitors - new and old. World's highest altitude motoring rally  the Maruti Suzuki Raid-De-Himalaya is back. In its 17th edition, the rally is set to kick off on 9th October from Shimla, the Queen of hills. Over 150 motorsport enthusiasts are expected to participate and cover a total distance of approximately 2000 km over 6 days. Excitement runs high, as S-Cross the newly launched premium crossover by Maruti Suzuki will make its first appearance in the off-road rally. A total of four S-Cross will participate in the rally. Maruti Suzuki Raid-de-Himalaya 2015: Highlights  S-Cross to debut  Highest ever participation of 150  67 participants in Xtreme Motorcycles and Quads (Highest ever)  38 participants in Xtreme cars and trucks  46 participants in adventure category  10 women participants Known as one of the toughest rallies with the most trying terrains, this year's Raid will traverse through an all-new and extra strenuous route. With the flag off from Shimla, the rally will pass through some of the harshest, yet most picturesque landscapes of Manali, Dalhousie, Rangdum and culminate at the valley city of Srinagar. Split into Adventure and X-treme, the mecca of rallying in Asia will take its participants through some of the highest altitudes  above 15000 ft, exposing them to the harshness of climate. With low oxygen levels and temperatures dipping to -21 degrees centigrade during night, the rally tests the endurance of the machine as well as the physical and mental fitness of the participant. For the first time ever, Maruti Suzuki Swift, India's one of the most iconic brand will be participating in the Xtreme category. Adding to the buzz are the all-women teams, who promise to give tough competition to the men in the rally. Bani Yadav, who has already been part of the Raid-de-Himalaya last year and Dakshin Dare this year, is one to watch out for. This year has seen a total of approx. 10 women participants, as against the average of 5 over the last few years. Meanwhile, Manali man, Suresh Rana, nine times winner of Maruti Suzuki Raid-de-Himalaya and three times winner of Maruti Suzuki Desert Storm rally will be back to raise the bar higher for the other drivers. Day wise info  table: Date Leg Event Night Halt 9th Oct Administrative checks Collection of material and documents for competitors Scrutiny  sealing and marking Shimla 10th Oct Ceremonial flag-off Shimla 11th Oct 1 Shimla  Baldeyan  Manali Manali 12th Oct 2 Manali  Dalhousie Dalhousie 13th Oct 3 Dalhousie  Srinagar Srinagar 14th Oct 4 Srinagar  Rangdum/ Zanskar Rangdum 15th Oct 5 Rangdum / Zanskar Rangdumk 16th Oct 6 Rangdum/Zanskar  Srinagar Srinagar 17th Oct Prize distribution at Centaur Lakeside SKICC, Srinagar ,Departure from the city - About the rally: Maruti Suzuki Raid-de-Himalaya is one of the two off-road motor rallies from India listed in the annual motorsport calendar of Switzerland based Federation Internationale Automobile (FIA) and Federation Internationale Motorcyclisme (FIM). The Maruti Suzuki Raid De Himalaya will be run in compliance with the International Sporting Code of the FIA, National Competition Rules (NCR) & General Prescriptions of the FMSCI. The rally is organized by Himalayan Motorsport, formed in 1999 with the aim of conducting motor sporting events in the Himalayan regions of Himachal Pradesh, Jammu and Kashmir and Uttarakhand. All members of HMA have been associated with motorsport for the last 20 to 30 years as rally drivers or organizers, across the country. Many are qualified Scrutineers and Stewards who have current Scrutineer and Steward Licenses from the FMSCI.